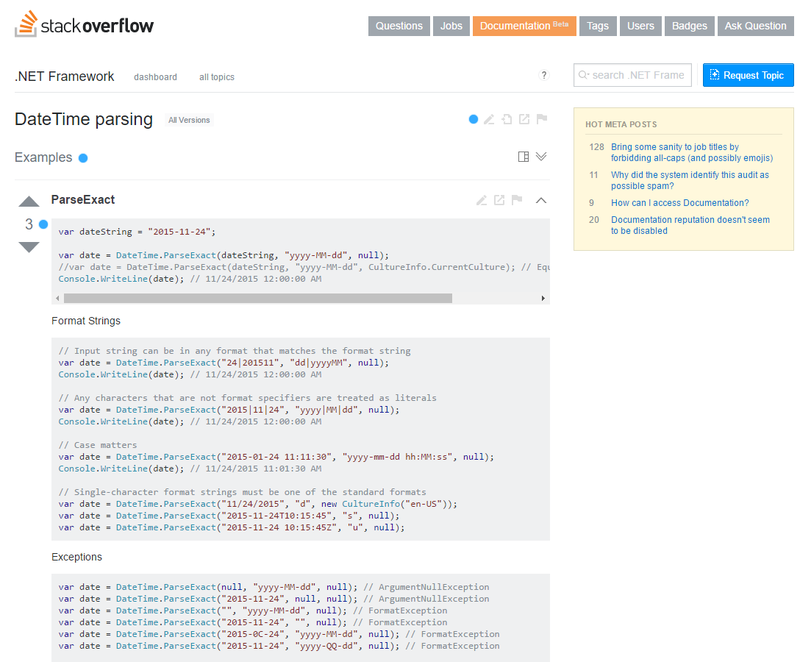 Today we are announcing a partnership with Stack Overflow to support Stack Overflow Documentation for Microsoft developers. As part of this announcement, we are announcing that Stack Overflow Documentation content will be integrated into docs.microsoft.com API reference content in the future. Microsoft has long been a partner with Stack Overflow in the form of sponsored tags, and the launch of Stack Overflow Documentation enables the community to have an easy way to create and vote on code samples using the .NET Framework, Xamarin, and other Microsoft products and technologies. Both docs.microsoft.com and Stack Overflow had shared goals - we want to make it easy and simple for the community to contribute great documentation for using products and services. Both sets of content have an open license, use markdown as the content format, and easily enable community contributions (Click Edit from any docs.microsoft.com page). When you first arrive at StackOverflow Documentation you'll find the familiar tag-based categorization of the topics available. At first glance you'll see all the tags previous created by the StackOverflow community. Once you filter by tag, a list of each appears with a few important metrics shown right up front - the count of topic requests, proposed changes, and improvement requests. Few developers have solved difficult problems without the help of the StackOverflow audience. Together with our colleagues, peers, and legends from the community who monitor StackOverflow for questions related to their own products, we've built a network of information organized by tags. 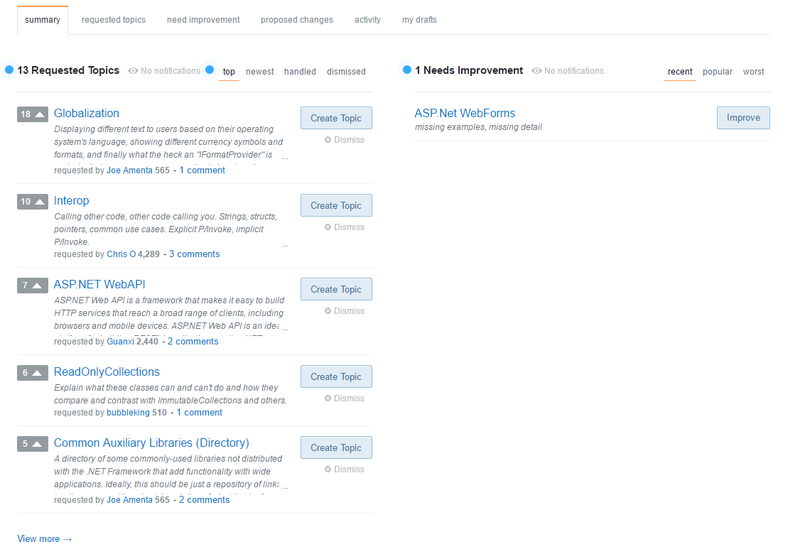 Documentation capitalizes on the audience commitment to collectively building knowledge by giving us a place to ask for help - the "Requested Topics" section of each tag gives the community a place to identify common problems. By clicking "Create Topic," you can create content for the topic, provide your own code samples and documentation. The experience provides guidance on where to provide each section of content, which can be edited using Markdown syntax if you prefer. As you create topics, your progress is saved in the right navigation, where you can see all of the draft content you've not yet completed or sent for review. As with the StackOverflow Q&A site, the code for individual topics is presented in clear, concise format so you can copy-edit-use or learn from simply reading the code. Developers can up/down vote code samples just like answers on Stack Overflow. In the future, docs.microsoft.com will integrate a curated list of Stack Overflow documentation samples directly into Microsoft API documentation. 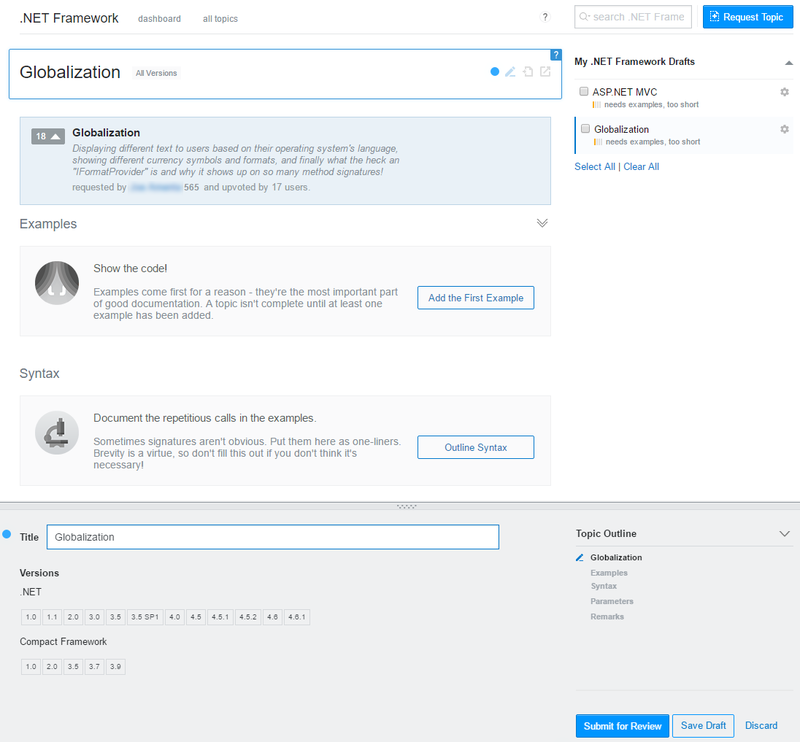 Developers looking at Microsoft API reference will see both samples created by Microsoft as well as Stack Overflow's samples created by the community. The samples will be curated to ensure that code samples use established .NET coding guidelines and best practices. We will release more details on this integration in the future.